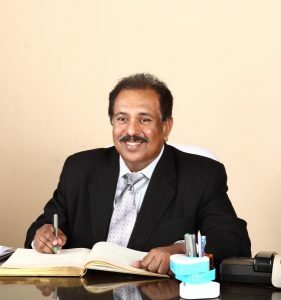 Dr. Francis C Peter possess an unique blend of Academic, Administrative, Technical, Managerial Skills and Competence which he had gained and acquired through his extensive experience of about three decades in the Industry, Finance and in the Higher Education Sector. Dr. Francis C. Peter served as the founder Vice Chancellor of Dr. K.N. Modi University, Rajasthan for four years. He had also served as the Vice Chancellor of Bhagwant University in Ajmer. He has an illustrious career to his credit serving at senior level as Chairman of the Board of the Studies (Engineering) of Kannur Government University, Kerala, Principal of Lal Bahadur Sastri College of Engineering( L.B.S.C.E), Kasargode, (A Kerala Govt. Undertaking), Principal of Viswajyothi College of Engineering and Technology( VJCET), Kerala, Principal of Hindustan College of Engineering , Chennai, Controller of Examination in Hindustan University and as Dean in Lovely Professional University, Jalundhar, Punjab. His first stint in academics was as Associate Professor with Manipal University in Karnataka. His first employment was as Senior Engineer for 9 years with Nitta Gelatin India Limited, Kochi. He was recruited by IDBI, Mumbai as Assistant General Manager (Venture Capital Department & Economic Research) where he worked for 3 years. He took his B.Tech in Chemical Engineering from Government Engineering College, Trichur and M.Tech from Coimbatore Institute of Technology. He was awarded the Doctorate Degree by Mahatma Gandhi University, Kottayam, Kerala for his research studies on “Problems and Prospects of Technology Management with Special Reference to Appropriate Technology”. At the outset, I wish to extend a warm welcome to all the students and staff of the prestigious St. Peter’s University. It is our primary concern to inculcate the ideas, skill, capabilities, opportunities, for your betterment of life and make you a source of good value and a better and worthy citizen of our beloved country. The portals of the University Education open to us a world of reality. It instills confidence by learning where we have the power to correct, refine, know and digest. It empowers us to use the faculties endowed with us. It helps in the application, critical exactness, sagacity, resourcefulness along with the cultivation of virtues. At St. Peter’s University we are committed to the high and lofty ideas proposed. My sincere wishes to all of you for a enjoyable and fruitful stay in our temple of learning.